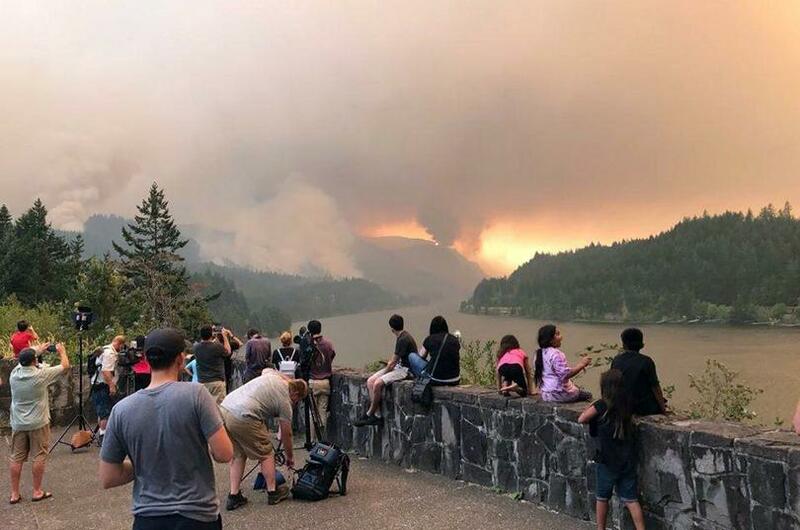 Federal workers say they are trying their best to keep the water flowing and the power going at Bonneville Dam in the Columbia River Gorge despite the wildfires. So far, the dam is still producing energy. But even if the U.S. Army Corps of Engineers had to shut off the powerhouses or evacuate staff, water could pass through the dam spillways safely. The Bonneville Power Administration says so far, only one stretch of major transmission lines that run from Bonneville to Hood River have been shut off. The town is still getting power from other lines. So what does it take to keep a dam safe when it's surround by wildfire? The Army Corps says there are multiple crews of wildland firefighters staging at the dam. And there are teams of structural firefighters in case anything on the dam lights up. There are also roving dam crews looking for spot fires -- around the clock. Many of the dam's staff have been told to stay home, or work remotely. Managers Work to Keep Bonneville Dam Going Despite Fires <-- Listen to story at orginal site.